This is a gorgeous picture book from the author of Lily's Purple Plastic Purse (among other great books). The illustrations sport bright colors and bold contour lines that really make them stand out. My mother and I first saw the book while working at the school book fair. 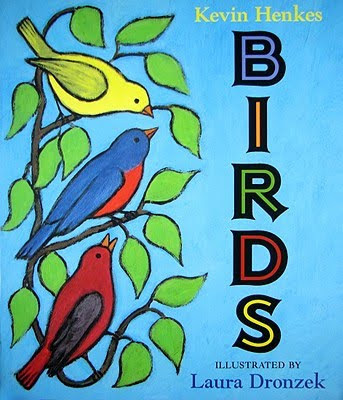 She noticed the subject matter (she's a bird lover) and I noticed the author. This, combined with the illustration style, makes the book a good choice for younger children. That is to say, there aren't so many words on the page that my one-year-old got bored of the illustrations before I had time to finish. Of course I think it's a good pick for older readers as well. Some of the text really excites the imagination -- asking open and fun questions that will engage anyone willing to pause for a moment and think. My neighbors (ages 2, 4, and 6) were captivated by a reading. In short, a lovely read. Check it out when you get the chance!